Most cities have plenty of flower companies. They all are competitors for a newly opened business in this field. But the new companies can stand out with their unique names to grab a market share. When the attention span of people is decreasing, a simple, unique, and catchy business name can work to drive the customers’ attention. Flower arrangement is a big business as the demand for flowers for a wide range of occasions increases with each passing year. The demand continues to grow for a variety of floral needs, delivery of floral bouquets, consultation, arrangements, etc. Your new company in this field can earn a nice profit and grow with sound marketing strategies. However, despite a robust demand, it is not easy for a new business to make a name in the competitive market. While you will need some effective marketing plan, the first thing to ensure to face many companies get a market share is to name your business appropriately. Remember that the name of a company can make or break its business. A simple and unique name will speak a lot about what your business values are. It will also help in giving your flower company a true brand image. With people having a good perception of your business, you can hope a steady growth in the coming years. If your business name is complex and fails to drive the customers’ attention, you will find conveying your brand message harder. With such a name, you may not get the desired marketing goals easily. Do you sell a particular flower? Is there any specific market that you want to target. Who are your target customers? You should answer these questions precisely to know your market niche. Once you do that, try to include the name of the flower or market in your company’s name. That is the way to let your customers know what type of flowers and arrangements you sell. Looking for a flower logo design? Many businesses have their name after their owners. You can also think of adding your first name to the company. But go for this option only when your name is unique and solid. If you are a flower artist, you should think of adding your name to your company name. This is the way to add your name to your company’s floral logo design, which will take your name and expertise to the target customers. How about adding some adjectives? That method is also a good option to add some exciting sounds to the name. For flower business, the adjectives are always a good choice of words. Another way to name flower companies is to include your city or any location name. With a location added to the company name, your potential customers can find your business efficiently on the Internet. All they need to do is to type the location, and your company is likely to come up on the search results. So, people can find out your whereabouts of the company. Later, when you design your logo, websites, brochures, business cards, and other promotional material, the location will be an inspiration for many graphic design ideas to target your customers. Choose a name that takes into account your company’s future expansions. For this reason, avoid geographical names. When you target more markets in future, the old geographic name will give a wrong message to your target audience. Name of a city will indicate that your business targets to the people from that city. So, pick a name that you do not have to change when you reach to other markets. Similarly, avoid using a particular occasion. For example, if the name suggests that your business caters only to weddings, you will change the name when you expand to other occasions. Moreover, with such flexible names, businesses do not have to change their floral company logos. With the same logo continuing for decades, people have faith in such a brand. Since your business should stand out, make sure that your name is also unique. It should be different from your competitors’ name. Therefore, research and make a list of flower businesses in your city and elsewhere. Then, come out with a name that sounds entirely different to catch the people’s attention when they hear it first. A key to finding out the right name of flower companies is to sit together with your friends and company people. Ask them to give their name ideas following some guidelines. You can place the competitors’ business names before them so that they come out with unique ideas. You can ask them to avoid complex and confusing names as well as hard-to-pronounce names. Make sure that while discussing the name ideas, consider how the names will look on your logo, business card, website, and other visuals. This is because these are important assets for business promotion. Note that when you hire a professional graphic designer, your company’s name will be an inspiration for the designer to get some exciting design ideas. So, consider this aspect also in choosing the names. 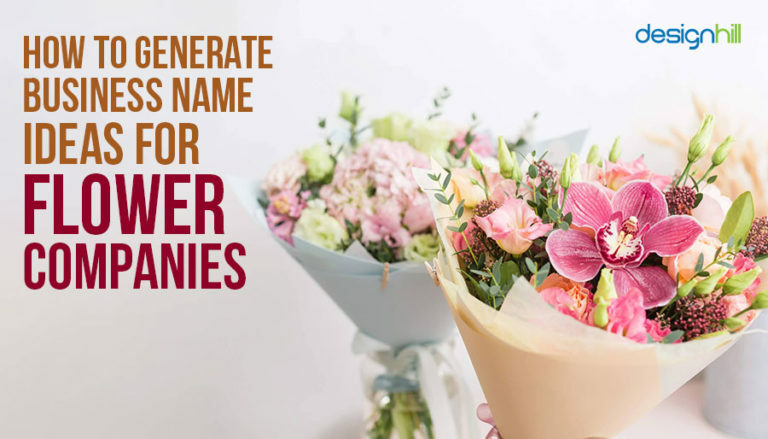 Another way to get more name ideas for flower companies is to use naming generator software. You can find plenty of such websites that let you generate a long list of names related to any business. Just type your business and industry keywords on the search box to have several suggestions. But not all such names are useful. In fact, most of them sound weird and strange as they are generated mechanically or without any consideration for a company’s brand personality and brand identity. These are just randomly generated names. But go through the list to find out some of the names that you find exciting and unique. Whichever name you choose, it should be unique and simple. In fact, that must be a guideline for your team members who sit together for brainstorming sessions. A simple name is memorable. People can easily pronounce the name, and so they can recall your flower company when they see its logo or other visuals. Once you have picked four to five name, check them for domain availability. Remember that you would like to create a website to put your flower business online. Your potential customers think of placing orders using your site. Also, they first want to search your business on the web to find more information about your products or services before visiting your shop or placing an online order. Therefore, make sure that the name you picked for your business is also available as your domain name. You can check the domain availability at sites such as GoDaddy. If the domain for your business name is available, register it quickly before someone grabs it. Take this step before you hire graphic design services to create your website for your floral business. You should also check if the name can be registered as your business trademark, which is so important to save your products or services from any infringements. Visit your federal or state govt. Sites and run a search for the name you want for your company. If someone has already registered the name, try other names from your shortlist. It should be noted that you may like to use the name in your flower logo design, which should also be registered as your trademark. So, pick a unique name that you can register legally and use in your logo as a trademark. These are the key points to consider when thinking of naming flower companies. The naming process may consume your lot of time and even days as you need to cover different aspects of your business under the name. Get feedback before hiring a flower business logo designer to have a nice logo as your business identity. If you pick a name hurriedly and create the logo, you may be recreating it if you change the name later, after getting some feedback. After you have settled for the right name, the next step is to give your flowering business a visual identity. To do that, create your logo, business cards, website, brochures, and other such design products that help you build your brand. You can depend on Designhill to have various design solutions at reasonable price. Flower companies can target their customers and drive their attention with a perfect name. The name should reflect the customers’ aspirations, geographical identity, and it should be able to build your brand image. So, brainstorm many naming ideas and pick the one that is simple, unique and available as your domain name.